The Sinivit Mine Landowners Association is calling on the East New Britain provincial government to fund an independent audit into the operations of the abandoned Sinivit gold mine. The developer, New Guinea Gold Limited abandoned the project in September 2014 after blaming the government and the Mineral Resources Authority for not quickly renewing their mining licence. It is understood MRA had notified the company to return and rectify safety and environmental issues related to the Sinivit project but this has not eventuated. Chairman Douglas Augustine said a submission was given to the provincial government in August last year requesting an independent audit to be conducted on the mine. He said before any mining project can be re-opened, an audit must be done to establish how much was generated by the mining operations in the past and who benefited from those funds. 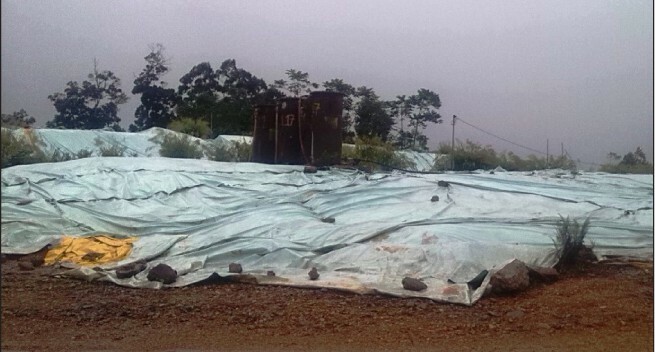 Mr Augustine said currently there is an environmental issue where some of the 29 abandoned vats used to extract gold and other minerals at the mine site were further damaged by heavy rain and flooding, with potential chemical contamination into nearby rivers of Warangoi and Nengmutka. “Right now most of those vats near the cliff have collapsed and I appeal to communities near the two rivers not to use it too much as it is not safe,” he said. Therefore he urged the provincial government and its administration to fast track an investigation or audit, so that any such issues are addressed before the mining project can be re-opened. The landowners say they are not against the planned re-opening of the mine, but want an audit and report to be tabled first before the mine can be re-opened. The office of the ENB Governor in response said the Minister for Mining will officially visit the mine soon to determine the next course of action. 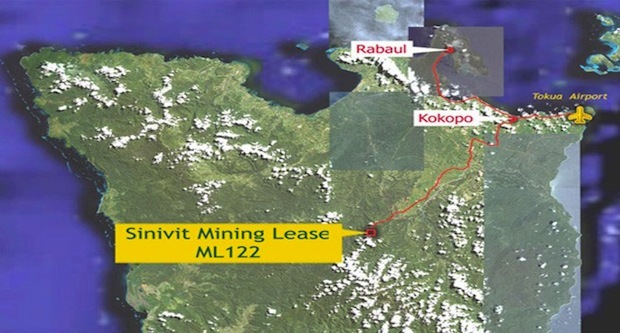 East New Britain leaders want the abandoned Sinivit gold mine reopened. Foreign owned mining companies operating in PNG are abusing our hospitality and trust by failing to pay any corporate tax. Companies like Barrick Gold, Newcrest Mining and Harmony Gold make millions of dollars from their “World Class” gold, copper and silver mining in PNG. But they manipulate their income and expenditure to avoid declaring profits and thereby avoid corporate income tax, according to figures released by the PNG government [pdf file]. The table below shows the corporate taxes paid by the mining industry in PNG in 2013. Foreign owned Barrick Gold (zero), Lihir Gold (K4.5million), Hidden Valley (zero), MCC Ramu nickel (zero), Simberi Gold (zero), and Harmony Gold (zero) paid a total of K4.5 million in Corporate Income tax. In contrast, PNG owned Ok Tedi Mining paid a whopping K105 million – so clearly 2013 was not a bad year for mining in PNG. To compound the injustice, Lihir, Porgera and Hidden Valley actually produce 3 times as much gold (1.5 million ounces) as Ok Tedi (500,000 oz) – so these foreign owned entities should be paying the most in tax, but they manipulate the rules to avoid their liabilities. In stark contrast to their miserly corporate tax contribution, the total value of the gold, copper and silver exported from Porgera, Lihir and Hidden Valley in 2013 was over K4,500 million. YUP, FOUR THOUSAND FIVE HUNDRED MILLION KINA! But these foreign mining companies paid NO corporate tax. THE Mineral Resources Authority has told a Canadian company to come and clean up the Sinivit mine in East New Britain it had abandoned. New Guinea Gold Limited abandoned the East New Britain gold project in September 2014 after blaming the Government and the authority “for not quickly renewing our mining lease”. MRA managing director Philip Samar told The National that they had notified the company to return and rectify safety and environment issues related to the Sinivit project. Samar said they had told New Guinea Gold Ltd that it was their responsibility to clean up their mess at the mine site. “Under the Mining Act, the company still has a mining lease that has not been cancelled,” he said. “Therefore, New Guinea Gold remains responsible to ensure all mining and environment regulations are complied with and safety measures are followed. He said the company responded by blaming the State and the Mineral Resources Authority for not acting quickly on its mining lease. “These unsubstantiated and misplaced claims by the tenement holder did not change New Guinea Gold’s social and regulatory obligations to fully maintain the mine. Samar said the company had not lodged any application with the MRA to have the mine placed in a “care and maintenance” phase. He said production had stopped but the site would continue to be managed safely and responsibly to ensure the mine’s security and stability. “There is a process to follow and you cannot just walk away after giving us a letter,” Samar said. “It is a legal requirement that a formal application is submitted. The Sinivit mine is currently under a renewal application for a new 10-year term. That application was with the Minister for Mining for a final determination in accordance with the Mining Act process and a National Court order issued in February 2014. There were reports that when the Sinivit mine was abandoned, locals looted and vandalised everything at the mine, including explosives and chemicals. Reports had surfaced of chemicals from the abandoned vats flowing into the Warangoi River. Meanwhile, provincial authorities had warned the people of Dadul, Riet and Uramot to stay clear of the mine site. COMMUNITIES near the abandoned Sinivit gold mine in East New Britain are warned not to interfere with relics, ruins and rubbish left at the mine site following the departure of project developer New Guinea Gold Ltd. Provincial administrator and disaster committee chairman Wilson Matava said fiddling around with these leftovers could endanger the lives of people and their environment. “The mine has been closed since July 2014. Last year, locals reportedly looted and vandalised properties, including explosives and dangerous chemicals from the vats,” Matava said. Matava urged the people of Dadul, Riet and Uramot to stay clear of the mine site area. He said there were also reports of dangerous chemicals from the abandoned vats seeping into the Warangoi River. Matava said the Mineral Resources Authority and Conservation and Environment Protection Authority had been working with the East New Britain administration to contain the potential contamination of the environment. Mining Minister happy to pick on the small guys – what about the human rights record of Barrick Gold or the environmental damage caused by Newcrest Mining? Why no action against the big boys Mr Pundari? Environment and Conservation Minister John Pundari says he wants Sinivit gold mine developer New Guinea Gold Corporation blacklisted so that they will not carry out any more mining activity in Papua New Guinea. He says he is concerned about the way the State is allowing small companies take part in mining activities in the country. “Such companies that do not have a strong mining back ground and proven corporate track record in responsible mining practices,” he added. He says such companies should never be allowed in the country. Pundari also suggested the government should establish environment bonds which can be used in the event of environmental damages. He will be bringing a bill on this issue to parliament next year. 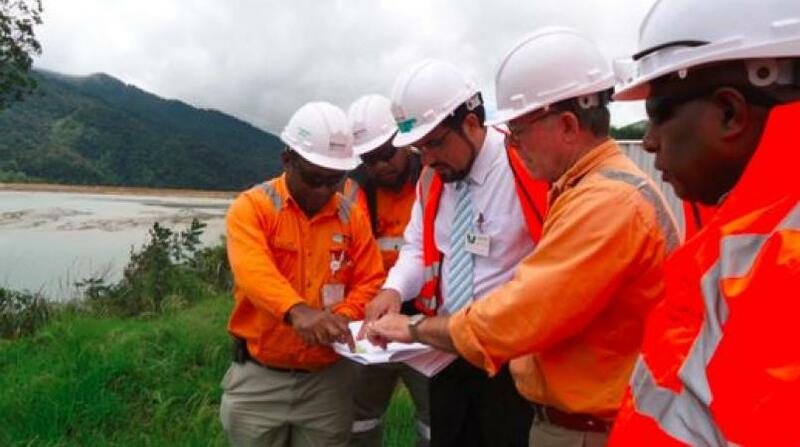 Environment and Conservation Minister John Pundari says he will hold Canadian company Niugini Gold Ltd responsible for abandoning the Wild Dog gold mine at the Siniwit LLG in Pomio district without proper consultation. Pundari told Parliament yesterday that technical officers from his department, who undertook site visits to the mine after reports of a disappearing act by the developer in April 2014, confirmed there was cyanide pollution to the river systems and other environmental dilemma caused from mining activities. “The developer failed its corporate social responsibility and legal obligation to notify the proper authorities, especially the Mineral Resources Authority and my department regarding its intention to close the mine,” he said. Pundari assured locals that the water was within safe levels for consumption. He was responding to Pomio MP who raised concerns on the environmental catastrophe caused by mining activities. CONTAINERS holding two tonnes of cyanide have been forced open, with spills making their way into the main waterways in the closed Sinivit Gold Mine in East New Britain. Another container filled with explosives and other detonating devices was ransacked recently and all its contents stolen. The main administration block at the site was allegedly burnt down by a group of people last month. Reports said the people were helping themselves to material from the residential camp areas and the processing plant. Tubal said a task force team last weekend inspected the damage and the administration was awaiting its recommendations. “Our aim is to protect our people’s lives and counter the risks stemming from the cyanide and other dangerous chemicals flowing downstream. “We do not want to see further damage and vandalism by a few disgruntled people,” he said.